This "fire agate" bead is pale copper in color, cut into an oval shape and framed in a sterling silver wire wrap. 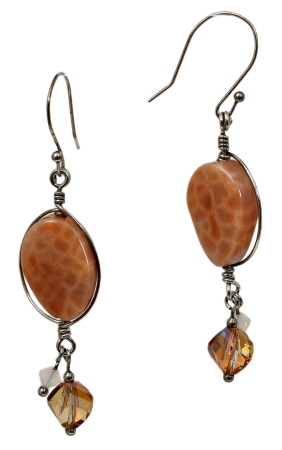 Accented with Swarovski crystal dangles in crystal copper and white opal. Earrings measure 2½ inches from top of earwire to bottom of dangle and weighs 0.15 oz each.